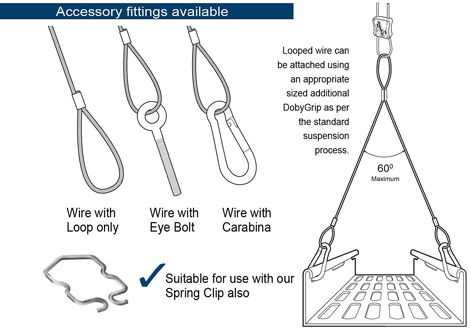 Specifically made to suit your own requirements, the Loop ended kit requires an additional suitably sized DobyGrip for the size of wire ordered. Please download the link below to complete your made-to-measure customer requirement form. Either email or fax it back to our head office where a sales representative will contact you to confirm your requirements. Alternatively, we have a wide range of standard Y-Fittings too. Kit A Made to customers own specifications of wire leg lengths, loop ended. Available in 1mm, 2mm & 3mm cable thicknesses. Suitable for DG1, DG2 & DG3 DobyGrip units. Height is adjusted using a DobyGrip as an additional extra to the kit. Minimum leg length of 150mm (inclusive of looped ends & ferrules). Re-attachment to service is effective when used with the Carabina accessory. Download Customer Requirement form & technical information.